I’m a Nikon photographer since the beginning, it was the most convenient camera I wanted when I started with a Nikon D90. After the D90 I’ve decided to keep working with the D800 for more than 5 years, until I’ve bought the Nikon D850. The first thing I usually do with a new camera is switching off the noise reduction on long exposure and high ISO, even if the use of the dark frame is pretty useful to remove hot pixels I don’t usually have time to wait for the camera to shoot it. After few days I’ve been contacted by the fellow photographer Mirko Boni and I did some test with the NR on long exposures, figuring out together that it’s probably bugged on the D850: it drastically reduces the quality on recovered shadows when shooting longer than 1″. These images are 100% crop of ISO 100 RAW shots with shadows and blacks recovered at +100 in Camera Raw, but the problem will appear even recovering much less. These two shots are taken at 0.8″ and 2.5″, NR off and changing only the f/stop. There is no difference between the two, except for the better definition of the 2.5″ shots due to the f/stop variation that increase lens details resolution and DOF. The details, noise and general quality of the file is the same. These shots have been taken with the very same settings, also same WB and Tint, but turning ON the long exposure NR as per default setting when you buy the camera. As you can easily see the left (0.8″) shot has the very same quality of the others above, but increasing above 1″ the exposure, like in the shot on the right, reduces dramatically the quality and ability to recover the shadows increasing the noise and adding an heavy green cast. The same problem doesn’t appear to be on the D800 or D750, so it’s most probably a bug in the NR algorithm that Nikon will hopefully fix soon with an update. Please be aware that the NR on long exposure is ON by default on the D850 (at least the one I bought), so it’s highly recommended to turn off the long exposure NR in the “shooting menu” as soon as possible to avoid shadow quality reduction. 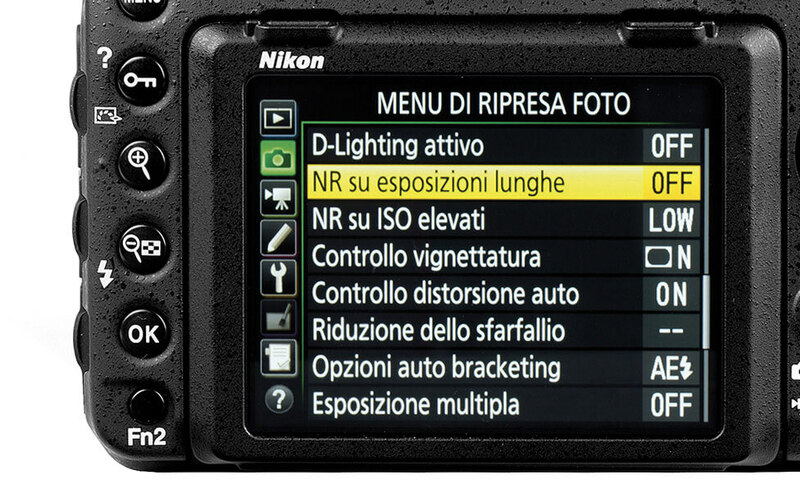 If you rely on this function quite often please keep updated on when Nikon recognize the problem and release a new firmware that will hopefully fix the problem.